The Vera Wang 2011 Spring-Summer Collection celebrates the fragile femininity of “tea party” and “garden party” dresses. Frothy gowns of extreme delicacy in the palest Easter egg tints of lavender, blush, rose and silver gray inspire a certain gaiety and youthful spirit. Occasional bodices of beautiful floral embroideries and skirts of hand-painted lace provide a charming counterpoint to the more sophisticated architectural pieces. 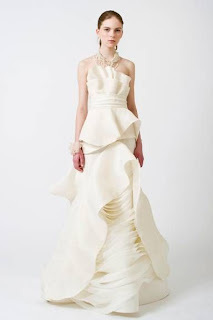 These are romantic artful clothes that appear to float- all lightness and air!